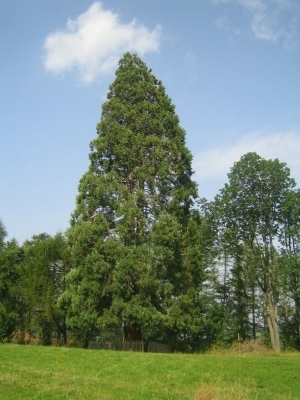 Sequoia or "Mammoth Tree" is a conifer of the "Cupressaceae" family that can be of Sequoiadendron, Metasequoia or Sequoia variety. They are giant trees that can reach the age of 3000 years; they can grow to be more than 100 m in height, with a trunk diameter of 13 m, weighing 2400 tons, located at the edge of the forests of the Sierra Nevada Mountains in the USA. Sequoia trees are among the highest creations on Earth today. The name "sequoia" was given in honor of the Cherokee leader Sequoyah (1776-1842), who invented a unique alphabet, teaching his people to read and write. One of the first books in the Cherokee language was the Bible (1825). The Sequoia trees are of three types: the Redwood Californian (Sequoia Sempervirens), also known as Redwood, often used as an ornamental conifer, the Giant Sequoia (Sequoiadendron Giganteum), considered the largest tree in terms of total volume, being protected by law and Dawn Redwood (Metasequoia), known only as fossil until 1941 when it was discovered in China. The official size record is held by a giant sequoia called "General Sherman," which is found in California's Sequoia National Park. It rises to 83.8 m and its circumference is 31.3 m at the base, which makes it the largest organism on Earth. Its thickness is more than ten times that of a blue whale. At an estimated 1486 cubic meters it contains enough wood material to build 40 houses with 5 rooms each. Its outer bark is said to have a thickness of more than 1.3m. It was originally thought about General Sherman that it is over 6,000 years old, but this date has now been revised to just 2150 years. 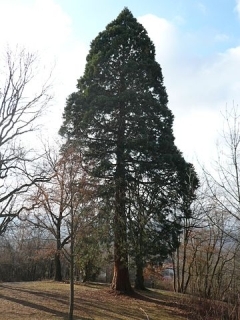 The highest tree in the world is a Sequoia sempervirens, called Hyperion. It measures 115 m in height. 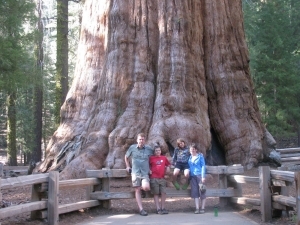 This tree was discovered only recently in 2006 in the so-called "Redwood National Park". Typically, this giant tree species grows in the forests of the Sierra Nevada Mountains, California, at an altitude of over 2000 meters. For those who did not have the opportunity to meet these giants there is now the chance to see them even in Romania. The most imposing tree in the Apuseni Mountains has been in place for more than a century at the foot of the Vladeasa Massif. The Sequoia Forest Reservation is located on the "Hill of God", between the village of Sacuieu and the village of Rogojel. Gal Silvestru, a Hungarian baron who studied and collected a variety of trees, planted several rare species in the area, such as the sequoia, the black pine and the linden. The two giants gaze nostalgically at Vladeasa's snowy peak, dreaming of the North American lands from where they were brought from. The Sequoia tree can also be seen in the counties of Arad, Caras Severin and in the cities of Bucharest and Oradea.